Want the best modules? Get ones with Samsung chips. All major enthusiast memory module makers came out in full force this week at Computex. Corsair, G.Skill, GeiL, and Avexir. I spent a good deal of time talking to all the players and discovered a commonality: all of them indicated that Samsung makes the best memory chips. I also made the rounds with motherboard manufacturers asking them the same question. Since motherboard makers do compatibility testing with all major memory modules, they also have a good understanding of what works best. Their answer? The same as the module makers. Samsung, of course, is the leading maker of DRAM chips. But modules can use a variety of different chip makes: Samsung, SK Hynix, Micron, etc. Back when DDR3 was still the latest DRAM technology, Samsung actually made its own line of enthusiast memory modules called the Samsung Green DDR3. In overclocking circles, it was considered the best modules for overclocking. The modules ran ultra cool, and overclocked easily from 1600MHz to over 2400MHz, all without using heatsinks. I personally used a set of Samsung Green DDR3 modules in my previous systems and swore by them. Unfortunately, Samsung doesn't make the Green series anymore. But their chips, according to the vendors that use them, are still the best. 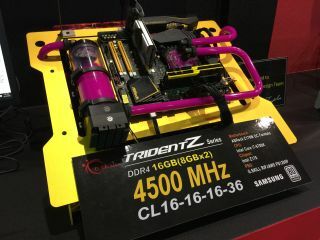 G.Skill in particular showed off a whole new range of DD4 TridentZ modules all using Samsung chips, ranging in speeds from 3200MHz to 4500MHz. It's often difficult to know what chips are being used when buying memory modules, but I'm definitely demanding Samsung going forward. Avexir also advertises its exclusive use of Samsung chips. Click here for all of our Computex 2016 coverage.